In a season made exceptionally difficult because of extreme wet weather followed by a hot, dry summer, one of the UK’s largest farming companies has benefited from their decision to switch to Ammonium Nitrate-based products after using urea and ammonium sulphate fertilisers for the previous two decades. Ammonium Nitrate’s speed of uptake was a real benefit this year with yield results for spring barley in particular more than proving this, says Richard Peck, Sales and Development Manager for Sentry. Despite the challenging conditions and resulting late drilling, their Cuckoo spring barley achieved yields up to 7.0t/ha with a final average of 5.5t/ha and zero rejections from malsters. “The extended period of exceptionally cold, wet weather that lasted through until the end of April meant that when we were eventually able to get on the land, it was vital that Nitrogen was taken up by the crops very quickly, which would not have been the case with urea. One of the UK’s largest farming companies, Sentry has some 200 directly managed, advisory and consultancy clients. Based at Cerne Abbas near Dorchester, Richard is personally responsible for five farms in the South West totalling 1600 ha and for 20 years has purchased key inputs such as seed, agrochemical, fertiliser and machinery for all Sentry farms throughout the country. “Our business is all about precision. We have 16,300 hectares under cultivation, from Leicester across to Norfolk, down to Kent and as far west as Dorset. “Every farm is different, and every client is different in terms of their objectives and requirements, so we create a bespoke package for each one. Individual farm managers are highly trained, multi-talented individuals who run businesses that just happen to be farms, he explains. “All are BASIS/FACTS-trained and have complete autonomy when it comes to deciding what crops to grow and what products to use on their farms, which differ vastly across the country. “They each do their own budgets, formulate cropping plans and decide what inputs will be required to achieve their objectives. Pooling purchases is much more efficient and provides much better control over input costs, Richard Peck explains. “Sentry’s scale of operation creates huge purchasing power, which means that we are much better able to negotiate with a small number of very carefully selected suppliers. Sentry is proud of its long-standing relationships with companies which Richard believes offer the best products or service in their sector. “John Deere supply all our tractors, we operate Claas combines, crop protection products are sourced through Agrovista, seed comes through Agrii and combinable crops are marketed via Gleadell Agriculture. This joined-up approach results in a win-win situation for all involved, he believes. “Margins have been very tight in agriculture for some time and there is no one single silver bullet solution, so we are continually looking to make small, incremental improvements in every aspect of our business. “In the late 1990s we switched to urea (46%N) and Ammonium Sulphate (21%N-60SO3) because the price per kilogram of Nitrogen from those sources was significantly lower than for AN-based products. “That more than offset urea’s limitations, namely volatilisation, inferior product quality and less consistent spreading. “Since then, the quality of these products has improved, depending on the country of origin, although we never felt there was a good reason to switch to any of the coated, slow-release urea products. While liquids have their place, and are used on some farms for certain crops and situations, they are more expensive and it’s not possible to have sufficient tank capacity to store all N requirements on farm in that form, he says. “That makes you totally dependent on an efficient supply chain, from the ships that bring UAN into the country to the lorries that deliver the finished product, so if any part of that fails, for any reason, you could end up with no Nitrogen. Last year, the decision was made to switch to Nitram (34.5%N) and DoubleTop (27N +30SO3), which are manufactured in the UK. “We continually track input costs and AN had become much more competitive, so there were clear economic, agronomic and logistical arguments for changing back to these premium products. “When the market opened in the summer 2017 we purchased all our AN fertiliser requirement for 2017/2018. “For me, it’s all about quality and these deliver exactly what you would expect from premium products. 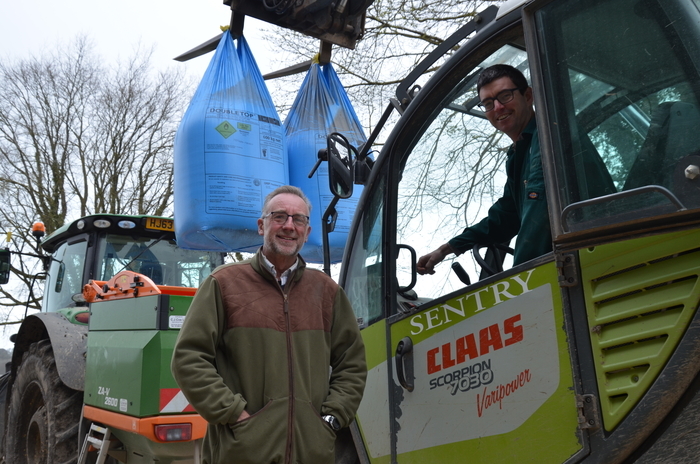 “They are truly uniform, with no lumps or dust, the contents of every bag are the same and they spread consistently at up to 36m, whereas urea is limited to 24m. “The fact that AN does not volatilise, gets into the soil more quickly and is taken up by the crop much more rapidly than urea was invaluable this season. In fact it was 23rdApril before the drilling the Propino and Planet spring malting barley stated using a Claydon Hybrid drill with the last of it going in on 4th May, he recalls. “Given such a late start, it was essential that the crop could access the nutrients it required as quickly as possible, so rather than apply some Nitrogen in the seedbed and some when the tramlines were visible, all the Ammonium Nitrate went onto the seedbed in the form of Nitram. “From the moment it emerged the crop looked fantastic. It grew away rapidly and continued to do so in perfect condition right through to harvest. Given that spring barley was drilled so late and never received any rain to speak of the yields were exceptional, Richard says. “Everything tells you that achieving up to 7.0t/ha from ‘cuckoo’ barley should be impossible, but that’s what we did, and it averaged 5.5t/ha. At the start of April, the weather conditions here were so bad that it looked as if harvest 2018 would be a catastrophe, Richard says. “I downgraded significantly all our farms’ budgets but given such a gloomy outlook back then, I was delighted with how the crops turned out.